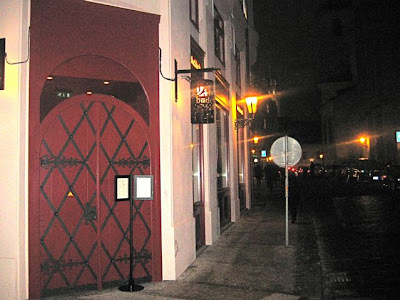 When I heard last week that a Buddha-Bar had opened in Prague's Old Town, I told V we had to make a pilgrimage. 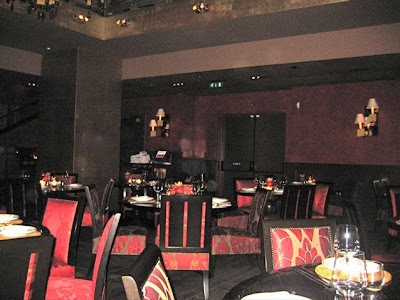 It's part of a stylish chain with restaurants in Paris, London, and many other big cities around the world. I knew it wouldn't be cheap. But how expensive, I could not say. There were no prices on their Internet menu. I did know that if I told V in advance how much it would cost, she wouldn't want to go. So I didn't say. I just told her it was a new place we had to try. The restaurant is underneath the new Buddha-Bar Hotel. We entered through the Siddhartha-Café at street level, which I initially thought was the restaurant. But for that, you have to descend two levels below the street. The bar is at the first sublevel. There were plenty of dark and intimate spaces. 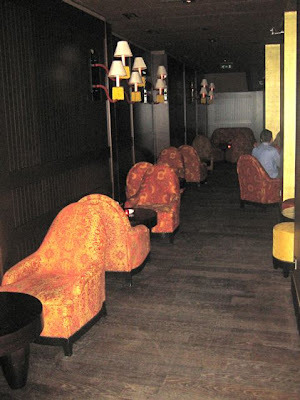 The area around the bar itself was not that large and had a few clusters of men in business suits. I didn't get a picture of the bar, thinking one of the businessmen might not appreciate getting his picture taken. Better safe than sorry. 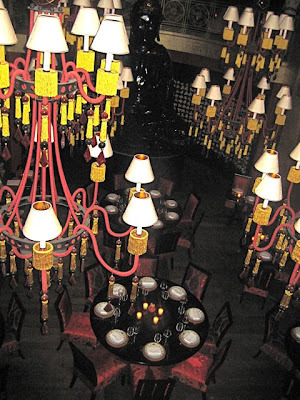 The main dining area sits below and can be viewed from the bar area through the big chandeliers. Only five or six the tables were filled in the 150-seat room. But I did go back on a Friday night a month later and the restaurant and bar were completely full of young, good-looking people wearing expensive clothes freely spending large sums.. 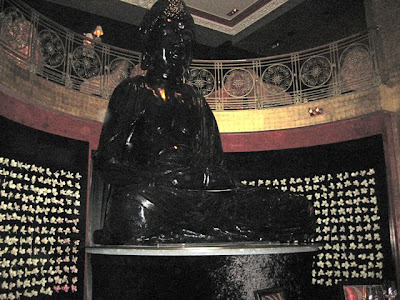 The space was dominated by a giant Buddha statue. It was also dominated by darkness. There was no possible way to read the menu in that light. I don't know if it was by chance that there were two candles on the table. But I had to hold the flame right up against the menu to see its offerings. V started by ordering a beer. It was a small bottle of Pilsner Urquell for a steep 100 CZK. Perhaps they'd like to discourage beer drinking. 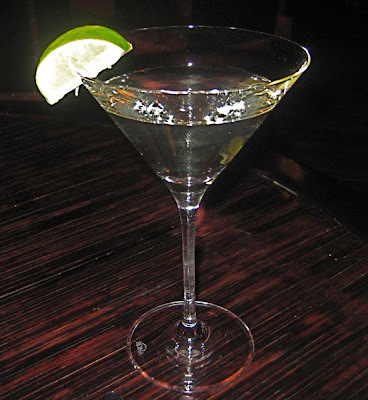 I figured the word "bar" is in the name of the place, so I decided to try a gin gimlet. It was excellent -- not too tart, not too sweet. For fun, I ventured a guess about much it would cost. I said 180 CZK. It actually was 190 CZK. That's a little above average for most Prague cocktail bars, but not out of line with prices in other world capitals. With the dollar ascendant these days, it felt better to think that it was around $9. 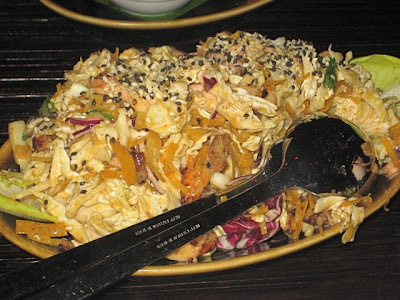 I started with the Buddha Chicken Salad (295 CZK). It was really delicious. The chicken itself was amazing - impossibly tender with blackened edges. It was mixed with a sweet wasabi cream. There was crunchy cabbage and noodles in the mix. Black sesame seeds were sprinkled on top. This was one of the cheapest things on the menu, but it was a large portion, enough for two to share. This was a dish I'd come back for. 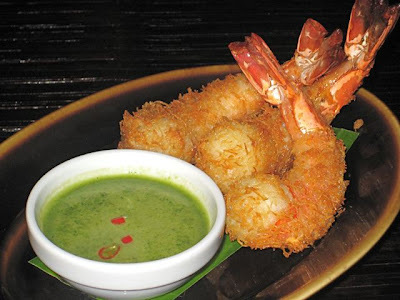 V ordered the tiger shrimp with coconut and basil (460 CZK). The three crustacean came with a fine panko-like crust. The best thing I can say about these shrimp is that they were very large. The shrimp were warm, but had obviously sat for a while after leaving the fryer. I thought they were on the chewy side, possibly overcooked. V said she detected some coconut, but I couldn't. It was very bland. On top of that, the basil dipping sauce was also bland. I ground a copious amount of salt into the sauce before it brought up some of the flavor. For a main course, I had the seared tuna (630 CZK). It perfectly rare, coated with black and white sesame seeds. There was a lettuce and seaweed salad on the side. The tuna was very fresh, but a little tough, with some strings of fat. There wasn't a lot going on beside the taste of the fish and sesame. We wished it had come with soy sauce and wasabi. It only occured to me later I could have asked for it. There was a small amount of chopped mushrooms on the side that didn't impress either of us much. The cucumber slices were pretty dull. The whole dish was quite small, really. I thought it was more like an appetizer. 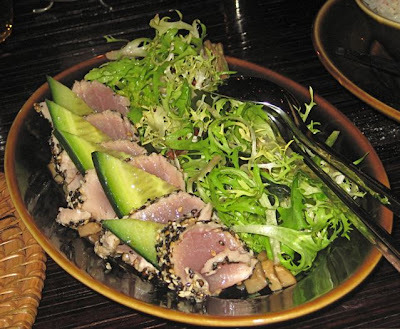 The seared tuna starter they used to do at Mozaika was similarly sized and far better for about a third of the price. You just don't get gold-painted walls with it. 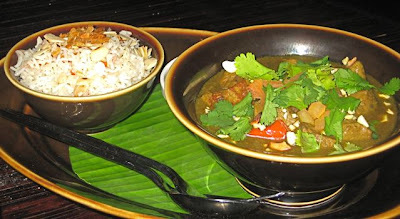 V had the lamb curry (665 CZK). I liked it. There was a generous portion of very tender meat with an assertive lamb flavor. There was a less generous portion of brown rice. The sauce tasted strongly of cilantro, and there were plenty of fresh leaves on top. It had a few peanuts in there, as well. There was a good sweet-sour mango chutney on the side. This dish was also just barely warm, not hot. It seems the kitchen expediting needed some work. As far as curries go, I'd say it was above average. But was it worth the money? That's fairly subjective and partly depends on the value you put on the style and cachet of the surroundings. For me, the answer is no. If it was half as expensive or if I made twice as much money, I might go back for it. For raw fish lovers, there was a full page on the menu for sushi (around 100 CZK per piece), sashimi (around 200 CZK per 3 pieces), and maki. Since the Internet menu doesn't list prices, I'll help out with a few other dishes on offer: lobster salad - 675 CZK, spring rolls - 365 CZK, wok-fried octopus and frogs legs - 400 CZK, monkfish path thai - 675 CZK, roasted black cod - 790 CZK, red curry shrimp - 700 CZK, Peking duck - 875 CZK, "Wagyu" grilled Kobe beef - 1475 CZK, red curry vegetables - 475 CZK. This is just a small sample of the items on the menu. And with some of them, you have to order an extra side item like rice. The service was mostly good and attentive, with a few hitches. After I squeezed the lime into my gimlet, I left the squeezed peel on the table. It sat there through most the meal until I threw it on a plate being cleared. Also, we were seated right by a red door that appeared to lead to an office of some sort. A manager kept going in and out, right behind us, at the beginning of the meal, which was rather off-putting and distracting. For dessert, I couldn't resist ordering a warm chocolate cake with liquid center and vanilla ice cream (250 CZK). 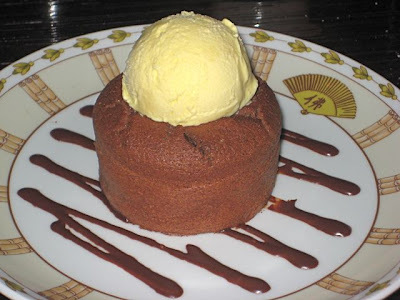 It was first-rate, perfectly baked, with high quality chocolate and very good ice cream. And, wonder of wonders, it was straight from the oven and hot, with steam rising as I broke it open with a fork. Yum. The total tab was 2900 CZK without tip. That's big money for me and not something we do very often. For a little less money, I'd rather go to Angel, where we recently ate better and for less. Of course, Angel doesn't have the same international renown or larger-than-life style. Buddha-Bar does have that style. But for the money, I don't think any of it should be dull. Yes, some of the dishes were good, but I wouldn't call it a great dinner. Perhaps it is what Bukowski would call art. Funny - I went to Buddha Bar AFTER I ate at Angel last Friday night. Talk about an expensive night out on the town. 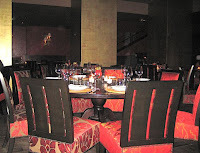 The style of Buddha Bar was great - it was almost an exact replica of the one in Paris. But, it is quite different than anything else in Prague. I am curious if it will be successful. If it is, it will be due to the tourists... I don't see many locals going to this establishment. My wife and I each had a glass oh champagne at Budha Bar. The bill was 900 CZK - orabout $45 USD!!! Pricey indeed. Nice write-up. I'm going to go ahead and say there was some sarcasm here. Just a bit. Sounds like a tourist trap, frankly. Maybe even in Paris?